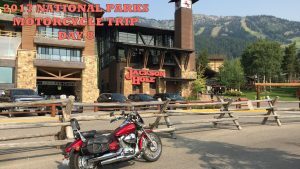 Today we rode our motorcycles to Jackson Hole Teton Village so that we could hike some trails at the top of Rendezvous Mountain. We took the gondola up to the top of Rendezvous Mountain, where we had a 360-degree view of Teton National Park and the Teton Mountains. Here is day 8 YouTube video.